Maeglin (S. ‘Sharp-glance’; called Lómin by his mother), the son of Eöl the Smith and Aredhel Ar-Feiniel (the daughter of Fingolfin), was an Elda of Beleriand. From Eöl and the Dwarves he learned mining and forging, but after hearing his mother’s stories about the power of the Noldor and the hidden city of Gondolin, Maeglin persuaded Aredhel to go with him to Turgon’s hidden city of Gondolin, where he hoped to be adopted by Turgon as his heir. And so in secret, Aredhel left their home in Nan Elmoth and went with Maeglin to Gondolin, where they were welcomed by Turgon. Maeglin, too, prospered in the Hidden City, being honoured as a prince of the highest rank. But Eöl, of dark and jealous mood, had followed mother and son to Gondolin, and in an attempt to slay Maeglin (who had renounced his father), slew his wife instead. In return he was cast from the hill of Gondolin and perished. Maeglin, the only son of Aredhel, was named the mightiest prince in Gondolin, second in rank to the King. But he was not named an Heir as he wished. When it became clear to him that this was being withheld, he grew increasingly bitter and jealous. Yet he continued to faithfully serve Turgon, and even fought bravely in the Nirnaeth Arnoediad. However, after he was captured by Orcs and threatened with torment, his bravery faltered, and weakened by his jealousy and hatred of Tuor (the eventual Heir of Turgon), he revealed all he knew about the Hidden City in exchange for his freedom. As a result, Turgon was slain, Gondolin taken, and Maeglin, too, lost his life – at the hand of Tuor, who cast him from the precipice of the Amon Gwareth, causing him to die in the same manner as his father. Lord of the Rings LEGOs!! 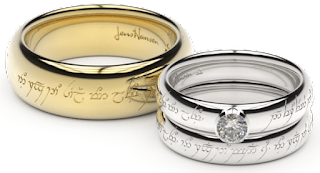 Want to Win a Ring from the Original Ringmakers?